See more in "Pig Farming"
Heritage Saddle Backs have taken 20 odd years to develop. 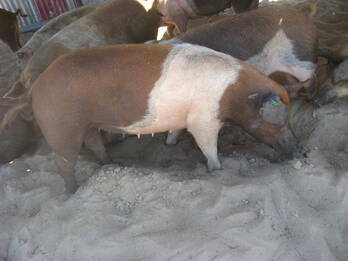 They are a brown/red and white saddle pig with either lope ears or spike ears. They are a gentle easy to handle pig, so animal husbandry is not a serious issue with this breed of pig. They have good big litters and enough teats to handle the numbers. Most of my girls have 14 - 16 teats and some have 18. They make up a private stud and at present is unregistered.